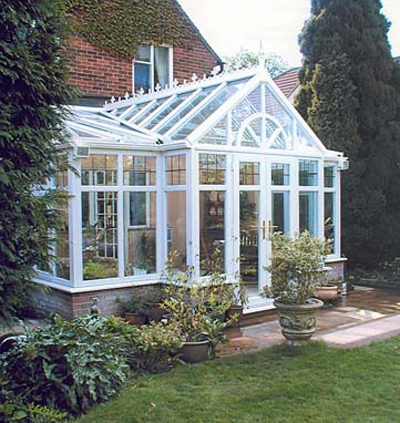 The T-shape conservatory style works best on larger properties. The T-shape is a combination conservatory style featuring a central projection. It can be Victorian, Gable or Georgian/Edwardian in style. The T-shape conservatory is a very versatile style, allowing you to create two distinct living spaces within the one room. With T-shape conservatories, the central part projects into the garden, which exaggerates the sense of bringing the garden into the home. 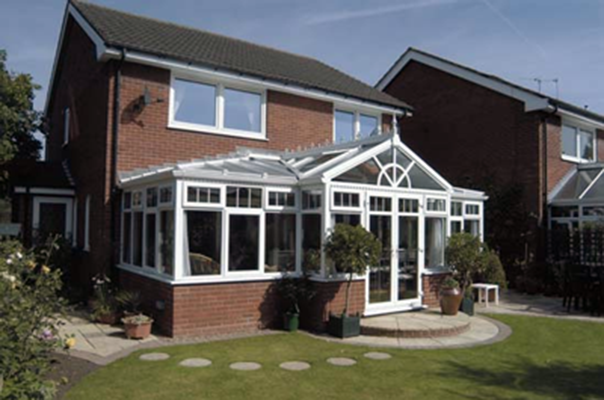 The central projection on a T-shape conservatory style can also create a 'porch effect'. This can highlight your elegant French doors. The T-shape conservatory is not only one of the most beautiful styles available, but also works well in just about any home. Your T-shape conservatory usually comes in Edwardian or Victorian styles, with the top part of the T adjoining the house and the other section extending into the garden. The T-shape conservatory tends to be a large style and is a good way of making a traditional Edwardian or Victorian style bigger, perhaps for a larger family. The T-shape conservatory is better suited to larger properties – especially those with big gardens, as the part of the conservatory that extends away from the house tends to eat into the garden. With two sections to this style, many people choose to use the large section as a dining room or to add extra space to their lounge,especially if it is at the back of the house. The smaller section tends to be used as a garden room. If you have children, it could also be used as a play area. This smaller area of the T-shape can be three-facet, five-facet or just straight-sided. On a large property, this conservatory section can look spectacular with steps leading down to the garden. At Bahama, we always go to great lengths to ensure that your T-shape conservatory matches the style of your house, whether it be period, modern or even a bungalow.